Tired of Haggling Over Prices? In life we teach others how to treat us – it happens all the time. Whatever we are willing to put up with is what we will get from many people. So – when selling your art or craft product, do you allow customers to devalue your work by haggling with you over the price, and then lower it just to get a sale? Although they wouldn’t think of arguing over price with their dentist, grocer or attorney, many shoppers think they should be getting a “deal” from self-employed artists by either insinuating or stating directly that your time, effort and talent is worth less. And that’s how many artists feel when this is done – worth less. No wonder many creatives have the self-perception that they have to put up with negotiating down their prices, which may have been too low to begin with, and that they will always be a “starving artist”. In contrast, my friend Louise, who is a jeweler with a fun and popular line, once exhibited at a large fair on the East Coast. A couple approached her booth – the woman very much wanted to buy a lovely pin, and the husband instantly launched into negotiations. He offered her about 60% of the value. Louise politely said no. After much argument and back and forth, she asked them to leave. His wife was furious. He was embarrassed. We laughed over that story for a long time. It truly demonstrates, though, what a confident and strong stance on your prices can and should be. When you understand the value of your work, be prepared to defend it and be prepared to teach people how to treat you. If you choose to have a sale, clear out old inventory at a reduced rate, or change your pricing structure, that should be your decision and on your terms. If you are willing to take offers, know that going into a situation and understand what your bottom line is so that you can make your needed profit. Have you experienced customers haggling over prices with you? What was your response? As a designer, the price issue shows to my buyers whether I am a professional or not. If you doubt yourself, you cannot stand firmly on your price. I learned this rule way back when…. Everyone loves to batter for something but this does not mean you need to approve. I no longer hesitate on my price and I continue to sell. Nathalie, you are teaching your customers to respect your work and your prices – good for you!! I can see how that can happen, people trying to negotiate. I think that many artists aren’t confident about the value of their product. Part of it may be -sometimes I feel this way- how easy it was to make it. But then I think, other people don’t have this talent and I am the only one who can make this painting the way it is. So they should pay the full price. Once I have decided which price I will put, it stays that way and there is no negotiating. Once I priced on of my pieces way too high -I mistyped on my website but someone paid the full price. First I felt bad but then I thought, well she must value it more than I do and it was sold! Your experience with the mis-typed price is really interesting. A commenter on another article on pricing mentioned that a buyer at a retail show wanted to buy some art which was similarly overpriced, but when the artist corrected the price by taking away a zero, the buyer refused to purchase, thinking that it wasn’t as valuable as she thought. These are great lessons! The post states see more of Julia fiber works? when I followed the link nothing..clicked on art nothing…not a fan of this…. Yikes! Thanks for bringing this to my attention, Trisha. The link was incorrect, and went to the wrong Julia Berkley! I have fixed this. Please try again with the link on the article. I’ve had similar experience with pricing and haggling with a now ex-friend. She wanted me to contact an artist that I had commissioned –for a custom work that I had given her as a wedding gift– and ask for a discount. I flat out refused. First I didn’t know the artist on a personal level (and even if I did, it wouldn’t happen), secondly I valued his work and felt his pricing to be very very fair. Third, she was at the time a self-employed attorney who had gotten plenty of referral business from me and I never asked HER to lower her fees out of respect for her knowledge and skill. We have value as artists. Art costs money to produce. We have to pay our mortgages and bills with the same kind of money that other folks do. Our groceries cost money, the same money that other folks use to buy food. I’m not inflexible, but if I sense that someone doesn’t respect the work or me, there is no sale. Money and self-worth go hand and hand. I believe so, in any case. I think if you reduce the price of a piece, in an odd way it implies you were trying to fleece the collector in the first place. If you could adjust the product, i.e. sell half a sculpture there could be a legitimate basis for a 50% reduction; but who wants half a sculpture? Once you change the price for no reason you open the door for endless negotiations. If they got a little, how about some more. When will they believe they got the best deal. Most Galleries I know have a ten percent discount built in, but they aren’t the artists. They can say it comes out of their commission. And I’m embarrassed to say I haven’t ever received anything close to retail from close friends and family. Last word? It feels great to say no but if you end up getting clipped, don’t feel bad about it. I don’t know many artists that have always had the luxury to walk away. But it does feel pretty good. Thanks for your honesty, James. There is definitely an unfortunate assumption by buyers of art that a price is not a firm “price,” but there is always room for negotiation. Something we would never do to our doctor, dentist or other professional, or at a retail store for that matter. 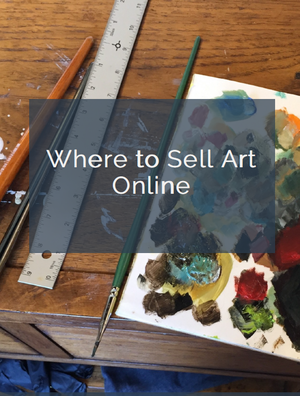 The problem is exacerbated because many artists will reduce the price because they want to sell their work badly, and so they are used in this way. This continues the cycle.